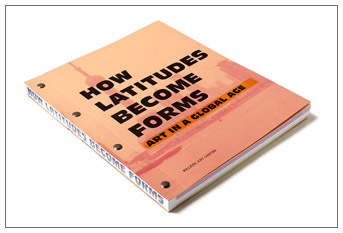 The catalogue for How Latitudes Become Forms looks at current scholarship on globalism and changing curatorial practices, and identifies critical models provided by artists themselves. This catalogue features thought-provoking essays and conversations by curators, critics, and cultural programmers from across the world as well as in the multidisciplinary artworks of more than forty visual, film/video, performing, and new media artists from Brazil, China, India, Japan, South Africa, Turkey, and the United States. Authors include Christi Atkinson, Cis Bierinckz, Philip Bither, Aimee Chang, Vishakha N. Desai, Steve Dietz, Douglas Fogle, Kathy Halbreich, Paulo Herkenhoff, Hou Hanru, Olukemi Ilesanmi, Vasif Kortun, Cuauhtemoc Medina, Gunalan Nadarajan, Otori Hidenaga, Raqs Media Collective, Susan Rotilie, Sarah Schultz, Kiyoko Motoyama Sims, Philippe Vergne, and Meredith Walters. Globalization From the Rear: "Would You Care to Dance, Mr. Malevich?" Revolt, Dysfunction, Dementia: Toward the Body of "Empire"
"Le Cinema Est Un Language Universel"
Just How Did Latitudes Become Forms?